Provide a safe method to carry a weapon - Covering the trigger area not only maintains safety during your draw, but also keeps debris out. This also stops the trigger from being inadvertently or accidentally pulled while the handgun is holstered in the pocket. Conceal the weapon - A properly constructed pocket holster should break up the outline of the weapon in the pocket and minimize printing. Make the weapon readily accessible - The holster should be wide enough to keep the weapon in an upright, accessible position within the pocket. 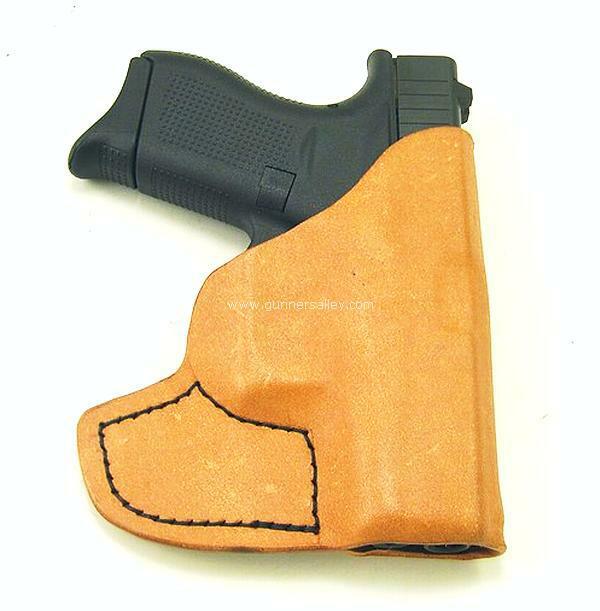 Allow for immediate deployment - An effective pocket styled holster should allow for relatively quick access, offer a full firing grip during the draw, and relatively quick deployment of the handgun. Leather - About 80% of all pocket style holsters on the market are made from leather. Some manufacturers use a stiff grade leather, while other use a softer style leather. The stiffer leather tends to be thicker in width, which can add to the overall bulk of the holster. Nylon - Many of the lower priced trouser holsters are produced from nylon. Though budget-friendly, a nylon pocket holster can occasionally lack the rigidity to properly break up the weapon outline. Kydex - As kydex continues to evolve in holster applications, a select few manufacturers are now using it to produce pocket holsters. Kydex is significantly more rigid and stronger than leather or nylon, and kydex pocket holsters tend to be very thin. Front Pocket models -This style is specifically designed to be worn in a front pocket and these typically use either a hook, thumb push, or stickiness as a release mechanism. This style will generally work in a front pocket on a variety of pants (shorts, jeans, khakis) and can also be worn in the front pocket of a jacket. Rear Pocket models -This style is designed to be worn only in a rear pocket and most are made to look like a wallet from the rear. This style really only performs well in a rear pocket scenario and, like a front pocket model, the success of a rear pocket model is generally predicated on the size and thickness of the handgun as well as the size of the rear pocket. Small or shallow rear pockets can cause issues with the wearer being able to get a full firing drip during the draw. Combination models - Combination model pocket holsters are ones that are designed to be worn either in the front pocket or rear pocket.These units typically feature a panel for rear pocket use that, when removed, allows the unit to be worn in the front pocket as well. What else should be considered when choosing a pocket holster? Release Device – Examine the release device that is used when the handgun is drawn from the pocket. Some manufacturers use a hook, while others rely on friction or a combination of the two. Be aware that, if these release devices fail or don't work properly, you could experience a draw problem or draw a holstered weapon. #1 - I've been carrying my Beretta Tomcat in my pocket without a holster and haven't had a problem yet? I know you guys sell holsters, but why do recommend a pocket model? It's a free country and there really isn't any reason that you can't carry a handgun in a pocket without a holster, but we really don't recommend it. And, yes, we sell holsters so we understand your point. However, if you go back up and look at the reasons that we recommend a pocket holster (the first two paragraphs above), then you'll see that it makes far more sense that carrying a loaded handgun in a pocket without a holster. #2 - I've been thinking about starting to carry a pocket gun, but I'm worried that other items in my pocket like keys or loose change will get into the trigger area and cause an accidental discharge. Will a pocket carry holster? To be absolutely clear here, we always recommend that you dedicate a pocket to pocket carry. By that we mean that the only thing in that pocket is the holstered handgun. We don't recommend that you put anything else in that pocket other than the holstered handgun. Most of the staff here who do pocket carry, use a front pocket holster and dedicate the front pocket on their shooting hand side as their dedicated spot for a pocket gun. For example, I'm right handed so my right front pocket is my dedicated pocket for pocket carry. Nothing else goes in that pocket. Period. #3 - What's the best pocket carry holster on the market? To be honest, there is no one "BEST" pocket holster on the market. As mentioned before, pocket holster models come in a variety of materials, configurations, and release mechanisms with some being more specialized than others. For example, some models are front pocket only, while other versions can be worn in either the front or rear pocket. Some models are covered in a sticky material that is used as a release mechanism, while others use a hook or thumb push off as a release mechanism. Some models are designed as one size fits all, while others are made specific to a specific handgun. Most shooters go through a process where they conduct research to narrow down the style or styles of pocket models that they want, then it comes down to some trial and error. #4 - I have a pistol with a laser mounted on it (a Sig P238 with a Crimson Trace laser). Will that work for pocket carry? Having a laser mounted on a handgun won't necessarily mean that it can't be used for pocket carry. We have a number of customers who purchase pocket holster models for popular pistols with lasers such as the Sig P238, Sig P938, Ruger LCP, Ruger LCR, Ruger LC9, etc. As long as the pistol or revolver is small enough to carry in a pocket, and you are running a relatively popular laser (as in a brand name), then we can most likely offer a pocket holster to fit it. Any of the MTR Custom pocket holsters listed below are available to fit a number of popular handguns with lasers mounted. #5 - So if you were going to make a recommendation between a rear pocket model or a front pocket model, which would you suggest? Our experience has been that the front pocket models are easier to hide and easier to draw, so we normally recommend a front pocket model over a rear one. #6 - I'm really giving some thought to trying a pocket holster but I'm concerned that I won't be able to draw my gun that fast when I need it? Are pocket holsters easy to draw from? Compared to other popular CCW carrying methods like IWB carry or AIWB carry, drawing from a pocket holster is a slower process. However, with practice (using an unloaded handgun of course), you can get a holstered pocket gun out pretty quick. Again, not as fast as drawing from appendix carry or standard IWB. While, you can become very proficient with practice, it's important to understand you aren't going to win in fast draw contests drawing from a pocket holster. Our most popular pocket holster models are listed below.